The EQUITY 2007 post-proceedings have been published! More info will be sent by e-mail soon. The IEEE digital library already contains all articles. 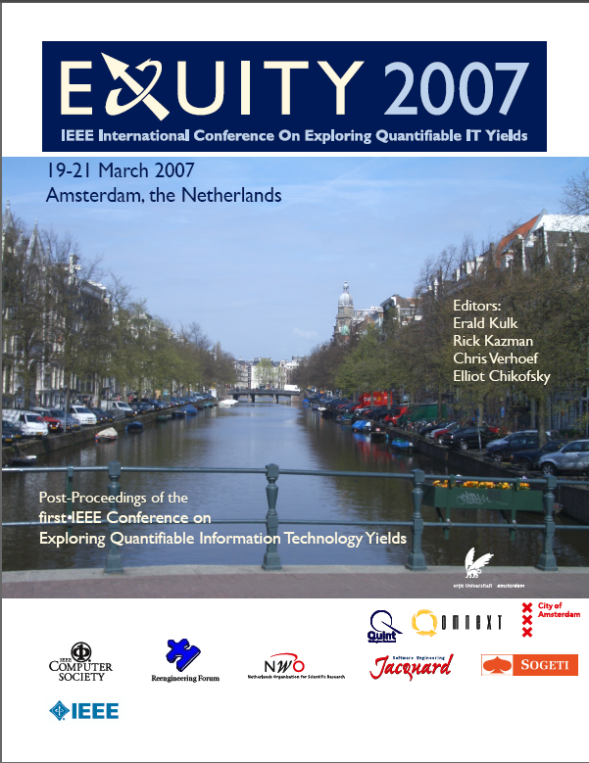 The First IEEE Computer Society Conference on Exploring Quantifiable Information Technology Yields, EQUITY 2007, was held in the Royal Netherlands Academy of Arts and Sciences in the city of Amsterdam, in March 2007. IEEE EQUITY is a new platform for researchers and practitioners to exchange ideas and results on exploring value creation (or destruction) through information technology. In particular, this conference focuses on quantitative methods for measuring, predicting, and understanding the relationship between IT and value. IEEE EQUITY will address the major challenges confronting quantitative approaches towards managing IT. The focus of the first IEEE EQUITY conference in 2007 will be the "Return On Investment (ROI) of software engineering".